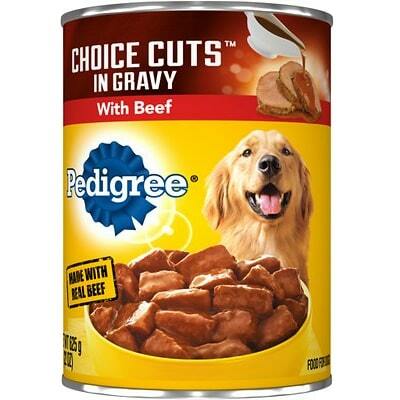 Pedigree Chunky Ground Dinner With Beef is a low-priced dog food that is overall a lower quality. This product has 6 controversial ingredients, including artificial colors. It has well-balanced amounts of protein, fat and carbs with meats and fats that are of a mixed quality. 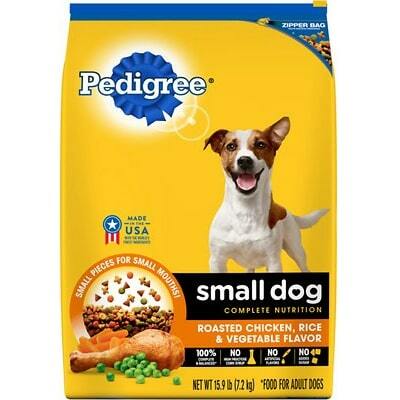 Pedigree has an average number of recalls, and overall was pretty transparent when answering our questions. 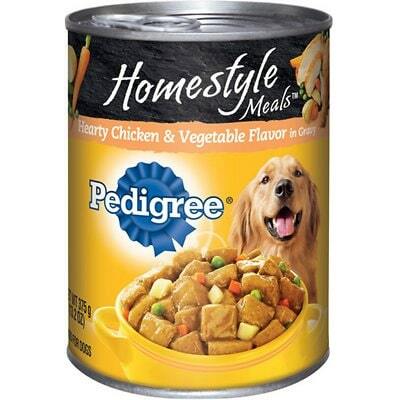 The average dog food we reviewed had 39 total ingredients, with 1 controversial ingredient. This product has 6 total controversial ingredients and 2 of them are in the first five ingredients. This is concerning because the first 5 ingredients make up most of the product. 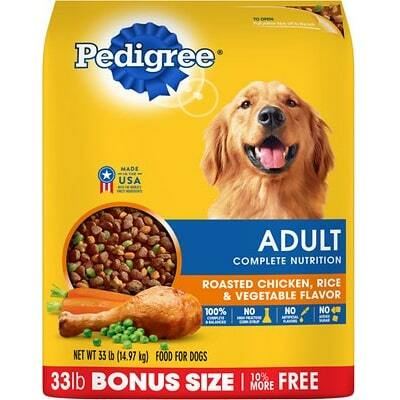 Pedigree Chunky Ground Dinner With Beef is made in the USA, which speaks to high quality standards and rules every U.S. dog food manufacturer must follow. Great! 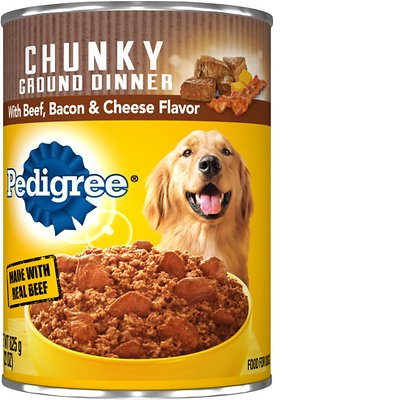 The meat quality in Pedigree Chunky Ground Dinner With Beef is somewhat mixed. The food includes Chicken By-Products, Chicken, and Beef - all of which are clearly show what animal they come from. But then we find Meat By-Products, Animal Liver and Bacon. These three let us only guess what species they are made of. Is it chicken liver and port bacon or beef liver and turkey bacon? We prefer foods that clearly label each ingredient source. The same issue exists for Vegetable Oil, which is fine in general, but doesn’t describe what plant it’s made from. This calls into question the quality of these unnamed ingredients. This product contains no controversial preservatives, that’s great. Keep in mind: Not all artificial preservatives are bad. That’s because they serve an important purpose, which is to prevent food from spoiling. However, we consider 11 artificial preservatives as controversial because of their potential link to cancer and other serious health conditions. No artificial flavors in this food, we like that a lot. 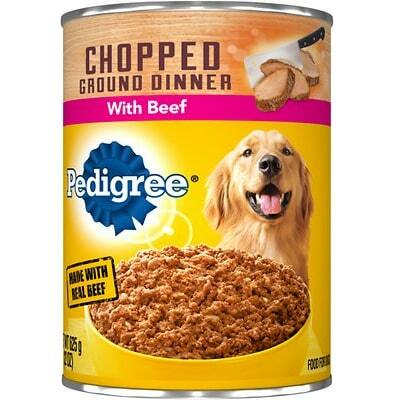 Pedigree Chunky Ground Dinner With Beef would be a better food if the manufacturer would skip artificial colors, too. Quality is he cornerstone of every aspect of our business and the number one responsibility of all our employees, suppliers and distributors. At Mars Petcare, we have a vision for making A BETTER WORLD FOR PETS®. The health and wellbeing of pets is our absolute priority. Our products are manufactured in strict compliance with the stringent guidelines set down by the U.S. Food & Drug Administration (FDA), Association of American Feed Control Officials (AAFCO), as well as each state's feed regulations and in many cases our own guidelines far exceed them. Under the Mars Supplier Quality Assurance Program, all of the raw materials that we and our suppliers use must meet our strict global internal quality and safety requirements, in addition to local laws and regulation. Our robust global standards, which apply at every stage of the supply chain, allow us to ensure that all of our products are safe, nutritious and enjoyable, meaning owners can feel confident that their pets will thrive on our products.